The weather has been delightful this April. 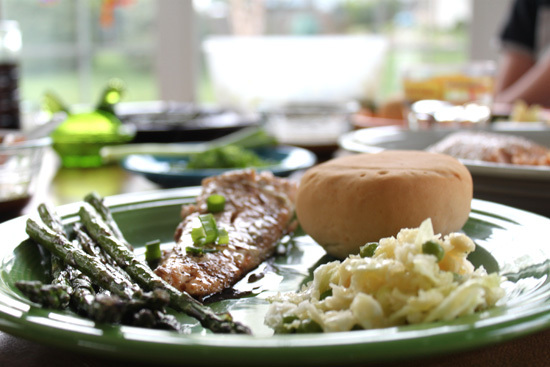 Tonight, we grilled salmon and asparagus. This healthy summer supper was served with a cabbage salad, a gluten free dinner roll, and a single serving of vinegar dipping sauce, on the side. Lightly brush salmon with oil of choice. Avocado oil is a nice option for the med/high heat of the grill. Season with salt and pepper, as you like. Grill your salmon over med/high heat for 5 minutes, or until cooked to your liking. (I like mine to cook longer and achieve a flakiness that would be considered overdone by many). First, clean the asparagus. How do you cut the bottoms so you don't end up with woody asparagus? My mother taught me to take a knife to the bottom, aprox 1 inch up, and if it's hard, go up until it's no longer hard, and cut there. Rinse well. Rub a tablespoon of oil of choice on asparagus, and season with optional salt and pepper to taste. These cook on the top shelf of the grill. Watch them closely as they don't take long to cook and you don't want them to blacken! Clean and shred one small head of green or purple cabbage. Dress with 1/4 cup sesame oil (or oil of choice) and 3 tablespoons of gluten free tamari soy sauce. Drizzle 2 tablespoons of honey and mix well. Add 1 cup of shredded carrots or cooked peas and chill. A whole grain bread for dipping is a fun side for us. Tonight, we used the quick and easy EnerG Tapioca dinner roll. It's not a health food, nor is it a whole grain bread, but we made up for it with healthy eating throughout the day. Our dip for this lightly toasted bread (warmed in the oven) was a delicious oil and vinegar dressing. I got this simple recipe from a Disney cookbook, and I just adore it for dipping a bread, or adding a touch of flavor to the fish or cabbage in this meal. Mix together 1/4 cup honey, 1 cup extra virgin olive oil, and 1/2 cup balsamic vinegar. Stir well. Keep extra in refridgerator for quick easy use that week. This was an easy dinner to put together, and the taste was a hit. The girls were not huge fans of the dip, as it appeared more of an adult taste, but they ate all of their asparagus and salmon without hesitation. We had our dessert earlier in the day, which was a serving of frozen tart cherries mixed with cocoa powder, honey, and rice milk to create a fast sorbet. Yum! Happy eating, now I'm off to go enjoy more fresh air.